The schoolchildren at Suncity Government Primary School in Gurgaon are a good example of just how many ways you can learn German in India – which are ultimately independent of your social environment. The school has been open for nine years and is housed in a once derelict, now refurbished building. It is dedicated to underprivileged children. Principal Chanchal Chawla’s greatest challenge is figuring how her students can continue to learn. Most of the children come from families of migrant workers, which means they constantly have to move to wherever their parents find work. The result: Drop outs. What further complicates things, is that the students get hardly any support from their families, since their parents are also often illiterate. Some children leave their houses each morning under the pretense of going to school, but then often just end up playing or earning money as “collectors.” Parents only find out about this weeks later when the principal informs them. There are a total of 210 students at Suncity. Some of them have already had to work, mostly carrying out very simple tasks. Mrs. Chawla can keep them away from working, at least for the moment. “Child labor and child marriage are both big risks for the students,” Sumina Kapoor, from the NGO Project Sunshine, acknowledges. “That’s why our projects also aim at developing skills for the labor market. 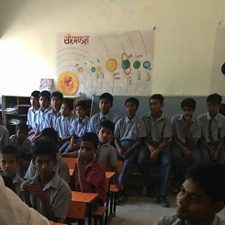 Since the quality of education at public schools in India is often bad, leaving children without any considerable skills, patents often think that school is a waste of time. “We’re trying to change that,” Kapoor continues. German class is one of the NGO’s newest and most successful initiatives. There are already 25-30 children who are interested. And that number is growing. This is only possible because “Project Sunshine” offers the course free of charge. The NGO strongly believes that German will help the children both in their future education and also on into their professional careers. After all, there are several German multinational corporations in India. While parents are often indifferent to what their kids learn, the students are very engaged and highly motivated. They know the advantages of learning a language, according to Sumina Kapoor, especially when we’re talking about Germany, a country with a stabile economy. “Project Sunshine” has started other initiatives at the Suncity Government School, including a karate course, in which ten children are already yellow belts, currently preparing to master it and move on to the next belt. Furthermore, there are yoga courses, foorball practice, art classes with various competitions. And there’s also badminton class, which is proudly taught by Amit Chawla, who plays on the national team. “Project Sunshine” sends its most talented football players to the “Bhaichung Bhutia Football School.” There, they have a chance at plating professional football, due to the talent scouting that takes place there. Additional programs on healthy nutrition as well as medical camps are frequently organized. Doctors come to visit and talk about health and hygiene. Clothing and shoes are distributed. Last winter, sweaters were given as presents to the students. A total of 35 volunteer aids support the activities of the Suncity Government School. There are professional teachers and coaches for karate, art and yoga, which are paid for by donations. Karate uniforms, supplies and clothing are regularly donated by aids, individual companies or individuals.